Welcome to our live coverage of events in Bangkok, as troops and anti-government red-shirts clash following months of protests. Refresh this page to see the latest developments with breaking news and comment, your e-mails and Tweets and insights from BBC correspondents. All times are BST. 1800 The BBC is discontinuing this live update page for the night. For the latest developments, please go to our main news page. Just to recap, seven people are known to have died in the latest bout of violence that has engulfed Bangkok as soldiers fight protesters around their fortified camp in the capital. The former prime minister, Thaksin Shinawatra, has accused the authorities of violating human rights and urged them to pull the troops back. The government insists its soldiers have only fired in self-defence. "There is absolutely no sign of the protesters going anywhere. The government says the aim at this stage is simply to contain the area and not clear it, but even that is proving a tough task. The longer it takes, the more blood is shed, and the harder it will be to solve the deep divisions that lie at the heart of this bitter conflict." 1747 Government spokesman Panitan Wattanayagorn tells the BBC he regrets that three journalists have been shot while covering Friday's clashes. "It is sad that many journalists are being caught in the crossfire. I think they have to be very careful. We are now setting up procedures to work with journalists to make sure they do not go into areas that are not safe," he says. 1733 Sean Boonpracong, spokesman for the red-shirts movement, categorically denies members of the red-shirts are armed. "The Reds are facing three whole [army] divisions. So far, not a single soldier has been harmed or injured," he tells the BBC. "Once the government uses live ammunition, we are entitled to defend ourselves. But we have no weapons. We have slingshots and rocks." 1721 Asked how the security forces are going to avoid a bloodbath, government spokesman Panitan Wattanayagorn tells the BBC: "In the past two weeks, we have reduced the number of protesters from 100,000 to 10,000. We hope that we will be able to reach these people in the next few days by offering them a peaceful reconciliation plan." tweets: "Cameraman Nik and producer Annie just done a lap of the protest site and all quiet on the barricades. Roads blocked in most places." 1708 Robert Haydock, originally from Manchester, is observing everything from his balcony close to the area. He tells the BBC: "Here on Ratchapraprop road, between two intersections and close to Ratchaprsong camp, there has been gunfire ongoing since around 3pm. The road is shut then reopens as the military advance and retreat. I have seen soldiers clear streets by firing automatic weapons in response to red-shirt supporters throwing various objects at them, including molotov [cocktails]. There have been a number of big explosions and helicopters fly high overhead." 1702 The risk consultancy firm, Eurasia Group, says the Thai government stands a good chance of clearing the streets of Bangkok of demonstrators. "But it will not end the polarisation that has led to the current instability - ensuring that the pressure from the red-shirts will persist and that political volatility will remain a persistent problem for Thailand for the forseeable future," it adds. "I live about 1km from what is happening. It is very stressful, because we are unable to go to work, detours have to be taken, and going to Chula Hospital is very dangerous. My medication is running low. Chronic patients need to see doctors. Two months is a very long time to seize the city." 1641 At least seven people have been killed and 101 wounded in clashes on Friday, the official Erawan emergency centre says. 1638 Army spokesmen Sansern Kaewkamnerd says there were an estimated 500 armed "terrorists" among the thousands of protesters. 1624 The former Thai prime minister, Thaksin Shinawatra, who was ousted by the military in 2006, calls on the government to pull back its troops and resume negotiations with the red-shirts. "The government's actions clearly constitute grave infringement of human rights and criminal offences for which the prime minister, the deputy prime minister and all concerned must be responsible," he says in a statement issued through an adviser in Bangkok. "I believe that (a) political solution still exists for Thailand and the prime minister is able to prevent more casualties and save our country." 1610 Canada announces the temporary closure of its embassy in Bangkok, citing "security concerns in the immediate area", according to the AFP news agency. It also urges both sides in Thailand to "work out their political differences through peaceful, transparent and democratic means". The US and UK have already shut their missions. 1602 Five people are now known to have been killed so far in the violence. 1556 Jirat, a resident of Bangkok, told the BBC: "I saw four people who were shot being taken away. I don't know if they were dead or injured. I am shocked by what I saw. "My biggest concern is our foreign minister claimed that the government is not using violence. I witnessed something different. Thailand is in the UN and yet Thailand doesn't adhere to humanitarian laws." Read more eyewitness accounts here. 1546 One of the protest leaders, Weng Tojirakarn, has told the Associated press news agency the camp is being surrounded. "We are being crushed. The soldiers are closing in on us. This is not a civil war yet, but it's very, very cruel." 1536 Journalist Michael Yon in Bangkok tweets:"A note was slipped under my door: NOTICE At this time because of the trouble outside in this area please stay in close all curtains and you are forbidden to go out of the hotel or out on your balcony at anytime." He is also posting regular photographs from Bangkok on his Twitter feed. "The soldiers, police and the civilian officers had no choice but to respond to these attacks by adopting the rules of engagement which the government laid out very strictly and very clearly from the beginning since we adopted the emergency degree. "The only cases that military, police and civilian officers can use live ammunition in is to defend their own lives, is to protect their own officers, is to protect the general public, is to use this live ammunition in such as case as aiming to those who have arms and begin attacking people in general. Also live ammunition is allowed to be used by the security officers in case of shooting into the air. Only in these cases is live ammunition allowed." 1521 Thai Finance Minister Korn Chatikavanij has told the BBC the government had no choice but to shut down the protests to protect the public. "I think we have shown incredible tolerance towards the use of violence - we do not want further lives to be lost. That is always a cost that is too high to pay. "We've been under enormous pressure domestically to end this but we want to do it in a peaceful manner, even if it's going to take a little bit longer than it might in other countries." He said an investigation would be carried out into the shooting of General Khattiya Sawasdipol, better known as Seh Daeng, and denied government involvement. "Certainly we can say adamantly that no orders were given for that action to be taken." 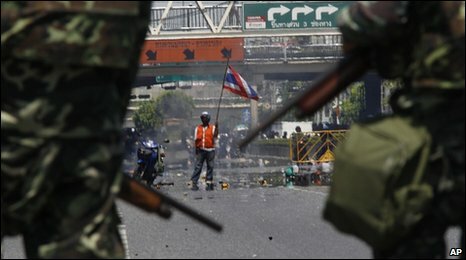 1508 The BBC's Rachel Harvey in Bangkok says: "There are two questions now - how can this particular crisis be brought to an end and the security forces regain control, and in the longer term, what does this mean for Thailand? "It is interesting that more than 24 hours after this operation began we have not heard directly from the prime minister. At some stage he is going to have to come out and reassure the Thai public, because at the moment, it doesn't look as if his own security forces are in control of the capital." 1458 Helmut e-mails from Bangkok: "I just took a taxi from the Oriental Hotel back to my hotel which is right around the corner from Rama 4. The driver got scared driving down Sathorn Road and I decided to take a motorbike - just in front of us was a large object on fire in the middle of Sathorn Road, a large pick up full of protesters with more tyres etc passed by and the crowd started cheering them on. "It is clear that those young army guys are facing a much bigger threat than just the official protesters. The prime minister has to step down." 1451 The BBC's Alastair Leithead tweets: "Just back in office after crazy afternoon to edit TV piece. Snapper told me a protester was shot in the head near our petrol station stop. "Lots of bullets and big bangs - even more confusing in the darkness. Interviewed a British guy manning the red barricades." 1442 The official Erawan Emergency Centre says four people are now known to have been killed in the unrest - it was not clear whether that figure was in addition to the two people already confirmed dead. A further 69 people have been injured, said the centre. 1435 The Bangkok Post is reporting that the renegade general injured last night, Seh Daeng, is still unconscious and on life support. It quotes a senior medical source as saying his chances of survival are "quite low". You can read more about the man known as "Commander Red" here. 1422 Komal Kawatra e-mails from Bangkok: "I've lived here all my life and this is definitely the most tense political situation I've seen, even more so than the airport closure by the Yellow Shirts and the coup that deposed Thaksin. "Protests happen often here, but I never imagined the situation would escalate so much. My driver was caught in crossfire on a flyover earlier today, and I have friends who live near danger zones so I hope the situation is resolved as swiftly as possible." 1401 Gerard Walsh, regional director of Asia for the Economist Intelligence Unit, tells BBC World Service: "I think the sort of nightmare scenario that the government must under all circumstances try and prevent is the red-shirts and the yellow-shirts coming directly into conflict with one another, because then effectively you're approaching a situation of civil war." 1356 On Thursday, Thomas Fuller of The New York Times was interviewing renegade General Khattiya Sawatdiphol in Bangkok, when the general was shot. He has told Eddie Mair of BBC Radio 4's PM programme: "We were talking with him and I asked him various questions about his predictions for the rest of the day. The last question I asked him was: 'Do you think that you will be able to fend off the military?' He replied: 'The military will not be able to enter.' And a shot rang out and he just dropped to the ground." 1341 Government spokesman Panitan Wattanayagorn tells the BBC that the security forces are using live ammunition, but insists they have only been "protecting their own lives and protecting the public's safety". "The objective of the troops is to set up the checkpoint outside the demonstration area. But there were elements of demonstrators coming out attacking the troops, so they're defending themselves," he says. The BBC's Alastair Leithead: "There was a series of explosions"
"Night has fallen but sound of gunfire is going on into the night - we've also heard reports of explosions near a train station. This whole area is effectively under siege - there are no hotels, no embassies, no offices, no shops no hotels - nothing at all. "It is very difficult to predict anything with any degree of certainty - but the atmosphere is not as if people are going to go back to the negotiating table. There is a group of people outside the red-shirt camp - some of them with sharpened bamboo stakes, piles of stones and Molotov cocktails - there is no sign at all of anybody backing down." 1321 Medical sources say 45 people are now known to been injured. 1315 Mike in Bangkok e-mails: "My apartment block is now between the army line and the red-shirts line. Sathorn Road is closed and the army appear to have set up to stop people getting down to Lumpini Park, which is where the violence was last night. "The red-shirts did not appear to be armed and they are just lined across the road jeering the army. I don't feel any threat in the apartment but the problem will be getting in and out for food and maybe getting back if the the army line moves further down the road." 1255 Correspondents say one of the reasons the military has been unwilling to take action against the protesters is the high number of women, children and elderly people in the main camp. Many of the red-shirts have come from the poorer rural north of the country. In the past two months, the camps have developed into small townships, with their own generators, kitchens and even massage stations. 1255 Primary school teacher Nick Thorne e-mails: "I saw a smoking object thrown from within the crowd at the soldiers. Then I decided to run away. As soon as I did the soldiers opened fire. Tear gas must have then been fired as I could feel it in my throat. "I have no idea where they were shooting. I didn't stop to find out." Read more eyewitness accounts from Bangkok. "The military presence is intensifying in areas adjacent to the main trouble spots. Troops donning body armour are in position in the tourist area of Sukhumvit and the Skytrain overhead railway has closed. "There is an unreal atmosphere and a real fear that what we have witnessed so far is only the beginning. Tonight will be crucial in seeing what way this situation develops. It seems very unlikely that the protestors can be dispersed without significant bloodshed." 1243 The red-shirts say the government of Prime Minister Abhisit Vejjajiva is illegitimate and a puppet of the military. They have said they will not give up their protests in the capital until parliament is dissolved and fresh elections are called. This BBC story has more information on the background to the latest protests and what the various parties are demanding. 1235 Briton Gary Burrows tells the BBC: "I've been in Thailand for six years, and two years in Bangkok. This is the worse I've seen things and things seem to be deteriorating. "At the start of the protests I was able to walk through the protests but after the recent violence I wouldn't feel comfortable doing that. "I hope that people on both sides see sense and end this stand off or it could just turn into a bloodbath. But I have the horrible feeling that neither side will pull back now." 1214 Suwarat e-mails from Bangkok: "I live around the protest area. The situation is getting worse and worse everyday. Sure it'd get more violent tonight. "Around my place I heard the bang from bullet or bomb all the time. It's getting much more scary since civilians are getting hurt more and more. I will wait for tonight's violence and hope everything will end tonight." "As the military have surrounded the protesters, other protesters from outside have come in and put up their own blockades, sandwiching the military between the red-shirts and the rest of Bangkok. "If the military goes in as they did on the 10 April when 25 people lost their lives, there is a real danger there will be bloodshed, but at the same time the government needs to control the centre of the city. The heart of Bangkok is out of the control of the government. "It's a very bizarre and difficult position for both sides and it's very hard to see how it can be resolved at the moment." 1202 Karnbulsuk in Bangkok tweets: "No matter who's right or wrong I have a hot headed friend who's heading to Rama 4 to do battle with the soldiers." 1145 David Fisher is a friend of France 24 journalist Nelson Rand, who was shot and critically wounded earlier. He told the BBC his friend was injured in the wrist, leg and abdomen. "We contacted the hospital, they confirmed he is there and said that he is undergoing surgery... Nobody is safe. You can't go there. "But we'll definitely go later, probably after midnight. We are watching the news and we are waiting for things to calm down." "I have just witnessed a seemingly neutral or non-red crowd turn against the army...The army blocked Raajprarop Road, which is reasonably close to the red encampment. "Suddenly the crowd that I was amongst, who were just watching this unfold, started jeering and beeping their horns at the soldiers. The soldiers ignored this but it continued for around 20 minutes. The crowd of just motorbike taxi drivers, shop workers and local Thais decided to move against the army. I could see the young soldiers didn't know quite what to do and eventually as the crowd drove their bikes and walked en masse towards the soldiers, the soldiers started to retreat." "The whole of the centre of Bangkok is an area that is now either controlled by red-shirt-wearing protesters who have blockaded themselves in to the centre of the city or by the military who are putting up their own barricades on the outside. "At the moment the real clashes are not between the military and the protesters in that area - other protesters have come in from elsewhere in the city and have barricaded in the military. So now we have a very confusing picture of the military trying to prevent anyone entering or leaving the centre of Bangkok but yet facing barricades behind them as people sling mostly fireworks but also some petrol bombs." Alastair has posted some of his pictures of the unrest on his Twitter account. 1122 Redshirt spokesman Sean Boonpracong, told the BBC World Service there were "40 companies of troops firing teargas, rubber bullets, as well as live ammunition" who had converged on the area. He blamed Prime Minister Abhisit Vejjajiva for the situation: "If he'd withdrawn some troops there would have been a hope for a chance of peace, however he persists." 1108 BBC business correspondent Juliette Foster says the Thai stock market has fallen by about 5% since the start of April as a result of the unrest - foreign investors have sold off about $584m (£400m) in shares. "It doesn't do much for Thailand's tourism industry either, a vital constituent of the country's economy, about 7%. The finance minister has said if we have prolonged unrest, we could see the economy contracting by about 2%. so this is not good." 1057 Kaushikpal in Bangkok tweets: "Traffic [is] chock-a-block as people come out in huge numbers to return to their homes; offices closed. City centre closed." 1049 Noah Severs, who has a jewellery factory about 100m from the main protestors camp, told BBC World Service: "This is the first time anything like this has happened in the business district, so close to where my factory is". He said while his factory was still open, quite a few customers who were due to fly out to Bangkok to visit it had cancelled because of safety concerns. "It's discouraging not knowing what's going to happen because we're really afraid that nobody sees an easy way out right now and if major clashes start occurring everywhere in Bangkok, between the protesters and the army, it's just going to escalate." 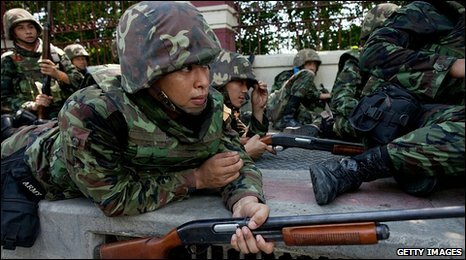 1049 The BBC's Alastair Leithead in Bangkok tweets: "Young nervous soldiers looking very scared firing live rounds. Took out street light. No indication of injuries if any from last gunfire." 1040 The BBC has a gallery of some of the latest images from Bangkok. You can send your pictures to the BBC using the form on the right. 1030 Medical sources say a man was shot dead on Friday - the second person killed in 24 hours. At least two journalists have been injured and a renegade general who backed the protesters remains in a critical condition after being shot on Thursday night. 1022 The BBC's Rachel Harvey in Bangkok says protesters are using slingshots and taunting the soldiers to provoke a reaction and disrupt their operations. "This is a very busy part of Bangkok under normal circumstances. The soldiers are gaining control of some areas but then running street battles with protesters in others. "It's still a very volatile situation on the ground. I don't think we can say at the moment that the security forces have full control of the perimeter of the camp, and that is what they are trying to gain." 1020 Oke, in Bangkok, e-mails: "The situation is bad, very bad. Soldiers fire guns at them - the protesters reply with arrows. Two were wounded." 1015John in Bangkok e-mails: "I am within 1km of the commercial district. Traffic is running normally, people are going about their business. I do not feel the "tense" situation being reported. "Most Thais I have spoken to are fed up of six weeks of business and personal lives being disrupted. It has affected tourism which will affect everyone eventually. The red-shirts have a right to peaceful protest but not to impact on others' rights." 1010 Quinton Quayle, the British ambassador to Thailand, told the BBC the embassy was closely monitoring the situation, but he advised against all but essential travel to Bangkok. "If you are here, think whether it is essential for you to be travelling around the city in the current environment. "The airport is operating as normal. We are not saying don't come - you can come and change planes at the main international airport. But be aware that the situation is unpredictable." 1005 The Bangkok Post reports that water and rubbish collection trucks will no longer be sent to the protest camp on the orders of Centre for the Resolution of the Emergency Situation (CRES), which is responsible for resolving the crisis. The CRES said it was because protesters could burn the trucks. The BBC's Alastair Leithead: "There has been heavy gunfire here"
0959 Government spokesman Panitan Wattanayagorn tells the BBC that troops are only allowed to use live ammunition under strict circumstances. "For example they can defend themselves, defend their own lives or in incidents where they're facing up to the terrorists - those who have automatic weapons and other weapons with them, they can move in to suppress them. "But our policy is clear - we are not going to send our security officers to the demonstrating areas at this point. We just want to secure the outer areas to make sure that we control the incoming activities." "I'm standing on the main diplomatic street in Bangkok where a lot of the foreign embassies are based. The road is blocked by a burnt out bus and by a group of red shirt protesters who are firing fireworks at the military. "The whole of this central area is being buzzed by a helicopter. There are hundreds of troops down here and I've certainly seen live rounds that they've been firing." 0942 Richard Barrow in Samut Prakan, Thailand tweets: "Those who have friends in Bangkok, please be assured the whole city is NOT a battle zone." 0937 Richard Strauss in Bangkok e-mails: "Thick black smoke is appearing in many areas where protesters are burning tyres. All office workers in the central area are being sent home. "Troops in their thousands are moving into areas surrounding the red shirt encampment. Very very frightening indeed." 0924 Scott Brown in Bangkok e-mails: "Nelson Rand, a Canadian journalist working for France 24, has been shot in the leg. His condition not known at present. He has been working in Thailand for at least 5 years. Very decent bloke. Hope he will be OK.
"Situation in rest of Bangkok is very calm as most people go about their daily business. 0920 The BBC's Rachel Harvey in Bangkok says: "Groups of young men are out on the streets trying to stop the troops setting up their checkpoints. "It is eerily quiet apart from the sound of gunfire - highways empty apart from burning tyres and groups of protesters taunting soldiers. It does not look yet as if the soldiers have regained control of the situation." 0918 The clashes, which have been sporadic, have been centred around Lumpini Park and the Suan Lum night market. Troops have used tear gas and fired live rounds. 0916 The military has deployed large numbers of troops to seal the protesters' camp, which stretches from the shopping district down to the Silom business district. Some groups of protesters are trying to disrupt the troops' activities. Read the terms and conditions At no time should you endanger yourself or others, take any unnecessary risks or infringe any laws.